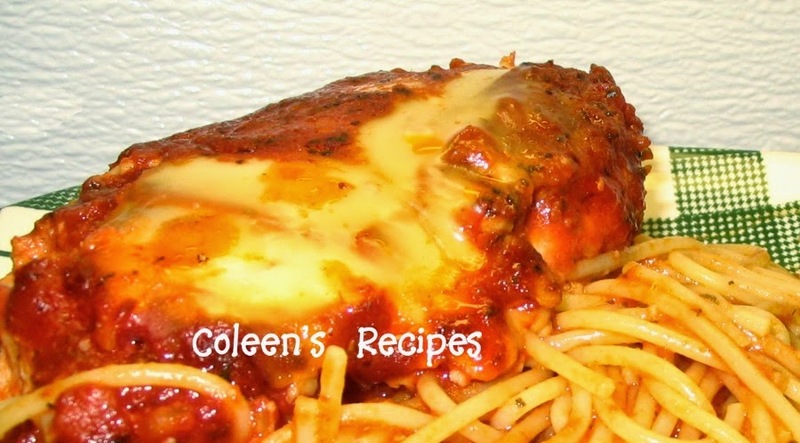 This is a quick and easy weekend recipe for chicken spaghetti and everyone loves it. I usually make this with chicken breasts, but it is also excellent if you substitute quartered chicken thighs and throw in some mushrooms....add a tossed salad and dinners ready. In small saucepan, melt 2 tablespoons butter and add 1/2 cup chopped onions. Saute onions at medium high heat until you start to get golden edges on the onions (the onions AND butter they cooked in, go into the sauce). Spray the inside of your slow cooker with vegetable spray before you put in the marinara sauce + water + well sauteed onions and butter + basil + oregano + garlic powder + sugar + salt + black pepper + cayenne pepper + melted butter (and mushrooms if you are using them). Stir well. Mix the bread crumbs and Parmesan cheese in one bowl and the beaten egg in another bowl. Coat the chicken in beaten egg, then roll it in the bread crumb-Parmesan mixture. Place the pieces gently (in a single layer) in the marinara mixture and spoon a LITTLE of the sauce over the chicken, but DON'T MIX AFTER YOU PUT THE CHICKEN IN THE SAUCE OR IT WILL KNOCK OFF THE COATING. Set your slow cooker on LOW for 3 to 4 hours and do not disturb the chicken while it cooks. 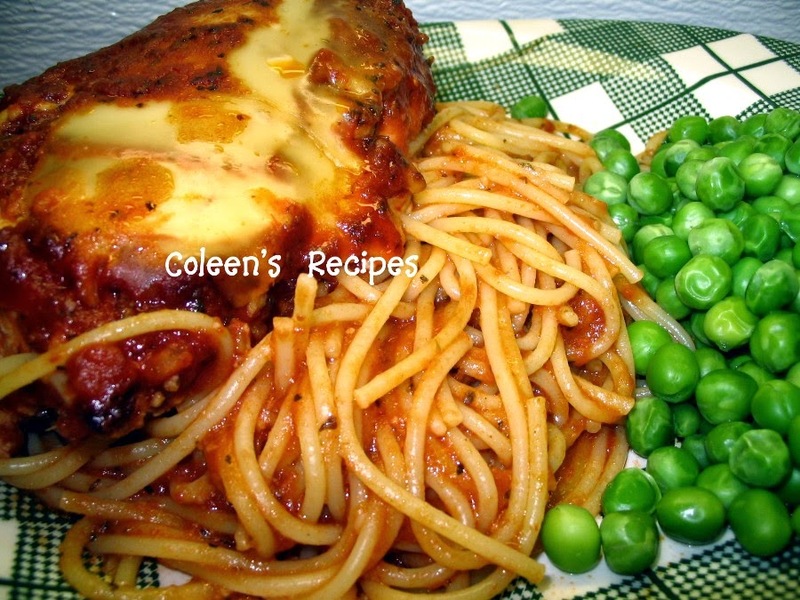 About 30 minutes before it's time to eat, GENTLY lift out the chicken and set it aside, then stir in about 1/2 pound of half cooked spaghetti noodles (that have been tossed with a little butter) into the crockpot (they will finish cooking in the sauce). Make sure the noodles are well coated, BEFORE GENTLY placing the cooked chicken back on top of the noodles (don't stir)and top each piece of chicken with a some mozzarella cheese. Put the lid back on and let it cook on LOW for 20-30 minutes or till cheese is well melted, DON'T STIR. NOTE: All crock-pots cook at different temperatures, so keep that in mind when you set your timer. I usually cook 2 chicken breasts for about 3 1/2 hours (almost fall-apart tender). Just keep an eye on the chicken the first time you try this recipe, so it doesn't get over cooked. NOTE: Chicken thighs cut into larger cubes works VERY well in this recipe too. NOTE: Use whatever commercial marinara sauce you like. Personally, I use an inexpensive brand (like Ragu) because the extra onion, oregano, basil, garlic, sugar, salt and pepper jazz up the marinara nicely. NOTE: This would be a fantastic recipe for a potluck dinner if you quarter the chicken breasts or use thighs.